Stay tuned for upcoming events for Comedy Night in near future. 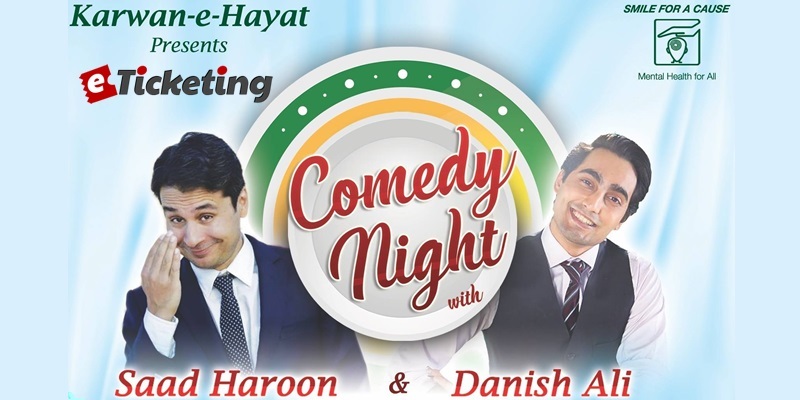 Comedy Night with Saad Haroon and Danish Ali will be organized on 9th December 2017 at FTC Auditorium, Karachi. This comedy event is being hosted by Karwan-e-Hayat, an NGO for the treatment of mentally ill patients. Catchphrase of this Classic Stand-up Comedy session is "Smile For A Cause - Mental Health For All". People in Karachi and nearby cities attend this laughter filled extravaganza. Limited seats are available, so hurry up and join for a noble cause. Karwan-e-Hayat (KeH) is a non-profit, charity organization geared towards the treatment and empowerment of the mentally ill. It works for relief, prevention, assessment, treatment and rehabilitation of psychologically distressed and underprivileged persons. Terms & Conditions : Karwan-e-Hayat reserves the right of admission to the venue and event. Best Viewed at 1024 x 768 pixels and above. This Page loaded in 0.06605 seconds on Tue, Apr 23, 2019 (20:56).